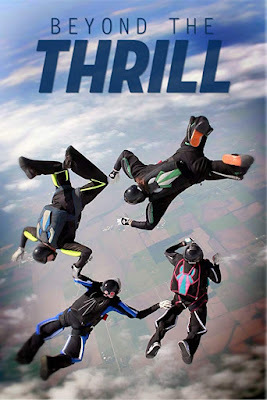 The problem with Jason Schumacher's BEYOND THE THRILL about competitive skydiving is that most people are going to see it on phones, lap tops and TV's and not big movie screens. The film follows a skydiving team who train and then jump performing various formations while they are filmed by a cameraman. We get to know the various members and come to understand why they love the sport so. If you've ever wondered why people jump from planes this film will go a long way to explaining it. These are (mostly) normal people who like to do a "crazy" thing. It explains how safe the sport is with less accidents than pretty much any other activities, including getting struck by lightning and it makes clear that you have better odds of winning the lottery than having both you're chutes fail. While the talking is all well and good the film really shines when we get to the jumps. The images are often breath taking and you get a real sense of what it's like to jump from a plane and why people absolutely love do do it. It will kind of make you want to go out and try it yourself...or find a big movie screen to rent so you can see the images massively huge so you feel like you're flying without leaving the ground. This is a super little film that finally highlights in detail a sport that we've all seen but mostly know nothing about.. BEYOND THE THRILL can be rented or purchased at Vimeo. For more information go here.